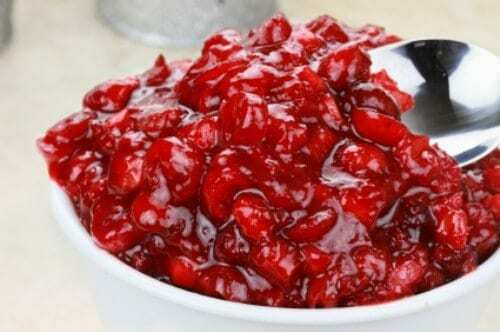 You can have this cranberry relish at home with our recipe. This cranberry relish has oranges, apples, and fresh cranberries and tastes so good! I got the ingredients straight from Luby’s, but the amounts took several holidays to perfect. They gave me the recipe to feed 200 people! You can make Luby's Cafeteria Cranberry Relish at home. Using your food processor, dump cranberries in a container with a puree blade. Slice and cube apple, removing seeds but leaving the peel on. Add into a processor. Wash thoroughly one orange and scrape zest. Peel both oranges, section and add to mixture. Add sugar and food coloring. Puree until all is blended. Refrigerate overnight for best results. Boil fresh cranberries for 8 min. before placing in food processor. Do not exceed 15 min, as it then changes the entire taste of the berries to a sour mash.